It’s been 35 years since the first class entered the Wright State University Boonshoft School of Medicine. Much has changed since then, including the name of our medical school, but as you’ll read in our cover story, much remains the same. We asked several members of our charter class about the changes they’ve seen in medicine since they entered medical school in 1976. We think you’ll find their answers insightful. One of the things that has not changed is our school’s commitment to diversity. The Boonshoft School of Medicine has been a pioneer in bringing non-traditional students into the fold since admitting its first class. 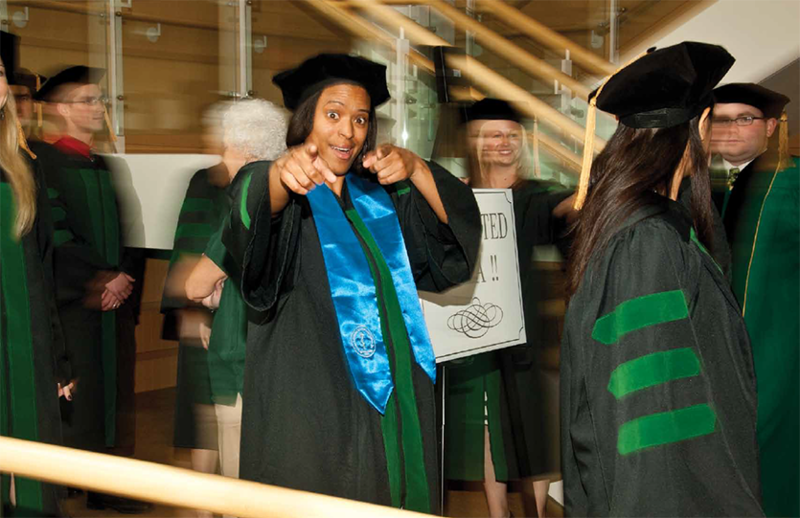 From its inception, our medical school sought out diversity in all its forms. In this issue, you can read about two of these non-traditional students: faculty member Dr. Jan Duke, who started medical school at the age of 48 after raising a family; and Dr. Jake Deister, a member of our 2011 graduating class, who as an M.B.A., left a promising career to take undergrad premed courses and pursue his dream of medical school. Since our first class graduated in 1980, we’ve seen 2,719 graduates walk through our doors. And I never cease to be amazed by their accomplishments. In addition to hearing from several members of our first class, you can read about Dr. Evangeline Andarsio, who has been a statewide leader in professional-liability issues and spirituality in medicine; and Dr. Sophia Apple, who serves as the director of breast pathology at UCLA Medical Center—evidence that another thing that has remained the same in the past 35 years is the quality of our graduates. Margaret M. Dunn, M.D., M.B.A., FACS, has been elected to a three-year term as a member of the Board of Regents of the American College of Surgeons (ACS). 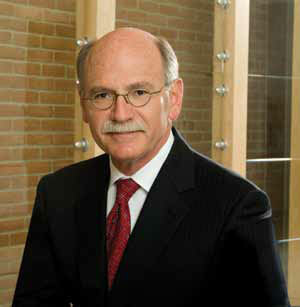 A general surgeon, Dunn serves as professor of surgery, executive associate dean in the medical school, and president and chief executive officer of Wright State Physicians. She was elected to the board during the college’s annual Clinical Congress in Washington, D.C. The Society for Neuroscience presented its Science Educator Award to James E. Olson, Ph.D, Boonshoft professor of emergency medicine, neuroscience, cell biology, and physiology. The award recognized Olson as an outstanding neuroscientist who has made significant contributions in promoting public education and awareness about the field of neuroscience. Doria Thomas strikes a pose as the graduates line up to enter the Mead Theatre for the 2011 Commencement ceremony. Thomas was one of the 101 members of the Boonshoft School of Medicine class of 2011 who were awarded M.D. degrees during the school’s commencement ceremony on May 27. Photo by Chris Snyder. We’re proud of our alumni and want to spread the word about your achievements. If you have professional news or personal updates to share—or simply want to stay in touch—please contact the Office of Advancement at som_adv@wright.edu or (937) 775-2972. Gregory Bergman, M.D., is practicing at Miami and Erie Medical Center in Minster, Ohio. He and his wife, Betty, have three children, Erin (29), Emily (24), and Anthony (21). They populate space programs around the globe and have even gone into space. They are key figures in aviation-safety agencies and vital to the operations of commercial airlines. They are the physician graduates of Wright State University’s 33-year-old residency program in aerospace medicine, a specialty in which residents rotate through, among others, the NASA Kennedy and Johnson space centers. The phone call came at 2 a.m. It jarred Dr. Evangeline Andarsio awake from a sound slumber. The husband of a pregnant woman carrying twins was in a panic. His wife’s water had broken and the umbilical cord was exposed. The babies would likely die if they weren’t delivered immediately. Andarsio told the man she would meet the couple at Miami Valley Hospital to perform an emergency C-Section. The science of medicine may have changed, but the art of healing remains the same. Our charter class reflects on how the practice of medicine has changed since they entered medical school 35 years ago. In the mid-1970s, medicine seemed to be destined for great advancements. Sophia Apple, M.D., contracted polio when she was just two years old and living in her homeland of Korea. The time of her illness holds no memory for Apple, but a slight limp reminds her every day that it actually happened. Still, Apple doesn’t regret the effects left from the disease and is, in fact, rather thankful for them. Jake Deister had a good life. He had a beautiful wife, a great job working for Montgomery County as a political liaison between the county and its cities, and a nice home. Then one day he decided to go to medical school. He discussed it with his wife, Brooke. They methodically counted costs, made plans, set goals, and embarked on their journey. But life intervened in ways Jake and Brooke never imagined. Results from the 2010 Dayton Area Drug Survey (DADS) conducted by the Center for Interventions, Treatment, and Addictions Research (CITAR) suggest the long-running trend of declining drug use by teens may be ending. A dream forgotten. A dream fulfilled. She had always wanted to be a physician, but life led her down a different path. After dedicating four or more years to intense study and rigorous, specialized training, the 101 members of the Wright State University Boonshoft School of Medicine class of 2011 were awarded M.D. degrees during the school’s commencement ceremony on Friday, May 27. Wright State-colored shamrocks were everywhere at this year’s Match Day on March 17, when graduating medical students gathered with family and friends to find out where they will spend the next three to five years as residents. Like most athletes, they are dedicated to their sport. With fierce determination and intense concentration they practice their moves hoping to shave a few seconds off their time or to perfect a graceful dance step. Save the date for the fourth annual Medical- Spirituality Conference featuring bestselling author Thomas Moore, Ph.D., on April 12, 2012, at Sinclair Community College. Moore is the author of the bestselling book Care of the Soul and 15 other books on deepening spirituality and cultivating soul in every aspect of life. He has been a monk, a musician, a university professor, and a psychotherapist, and today he lectures widely on holistic medicine, spirituality, psychotherapy, and the arts. As a pediatrician with a master’s degree in public health, John Pascoe, M.D., is more attuned than most to the difficulties less well-off patients face paying for health care. In the past few years he noticed that more of his privately insured patients were having difficulty paying for the medications and treatments he prescribed, but he didn’t know how extensive the problem was. So he decided to take a closer look. Third-year medical student Jason Thuener is already making his mark on medicine. Although he’s still one year away from earning his M.D., he has received national recognition from the American Medical Association (AMA) Foundation for his contributions to medicine through advocacy, community service, and education. The AMA Foundation recently awarded him its 2011 Leadership Award, making him one of only 24 medical students in the nation to receive this honor. Longtime Boonshoft School of Medicine employee Teresa Traylor passed away on May 29, 2011. Traylor was a familiar face to medical students for many years as a staff member in the Office of Student Affairs and Admissions. It’s almost a cliché, like saying you want world peace at a beauty pageant. Yet it is a very real goal for many researchers who work tirelessly to stop this disease, which accounts for nearly one in four deaths in the United States. The Dayton region’s largest academic multi-specialty group, Wright State Physicians (WSP), held a groundbreaking ceremony on June 21 for a new medical office building on the campus of Wright State University. The new building will offer a full array of physician care under one roof, including new neurology and sports medicine practices, as well as the existing practices in orthopaedics, family medicine, geriatrics, and dermatology. Like Sir Galahad searching for the Holy Grail in the Arthurian legend, Christopher N. Wyatt, Ph.D., is on his own quest… to discover how the carotid bodies control breathing. In fact, he has been on a crusade to unlock the mysteries of these tiny oxygen-sensing organs since 1991.